The three dolphins that were in the river in Buratty in April have been observed in the Shannon estuary from a dolphin tour boat. Following the disapearance of the three dolphins from the river in Bunratty we had hoped that we might record them during ongoing monitoring of the Shannon dolphin population this summer. The SDWF carry out annual monitoring of the dolphins from dolphin tour boats operating from Kilrush and Carrigaholt, Co Clare and during dedicated boat transects. As part of thi smonitoring all dolphins observed are photographed and analysed to see if they have unique, permanate marks that can be used to identify individual dolphins. The Shannon catalogue which was started over 20 years ago contains images of around 240 individual dolphins. Some dolphins are not marked and thus cannot be recognised and monitored. The three dolphins in Bunratty were not very well marked but two had small nicks on the trailing edge of their dorsal fin and all had tooth rake marks. This demonstrates again the value of long term monitorin gand the power of a photo-id catalogue to monitor the Shannon dolphins. The Shannon Dolphin Project was 20 years old this May and the dolphins are known to be a relatively small (c. 120 individuals), genetically discrete population which is only found in the Shannon Estuary and adjacent Tralee and Brandon Bays. Each dolphin is important and it is reassuring to know that the "Bunratty Three" are healthy and have rejoined the Shannon population. We have had no reports of the dolphins at Bunratty since Saturday and assume the dolphins have returned to the Shannon Estuary. The Shannon Dolphin and Wildlife Foundation will be monitoring the Shannon dolphins this year as part of there ongoing monitoring programme. we will be paying special attention in trying to record these dolphins to confirm whether they are back with the Shannon dolphins and to assess there condition. Thank you to all of you who assisted with reports, information and images. A very interesting experience. Following a busy weekend at Bunratty it appears the dolphins are spending less time at the bridge. On Friday dolphins were present in the morning and in the evening around high water and remained there for around an hour foraging around the bridge. Interesting dolphins were upriver during low water and not out in the estuary as we might have expected. On Saturday Gary Robinson reported "Between 10.00 and 11.00 I observed all three and they stayed up in that area of the river, not venturing below the bend. They did not show themselves very frequently and when they did it was just their dorsal fins breaking the water�s surface. Between 11.00 and 12.30 they spent their time moving from the bend in the river downstream towards the first bridge and back up to the bend in the river once more". They were not seen in the evening. On Sunday no dolphins had been reported up to 5pm but may have occurred at high water in the evening but it would have been dark. With the rain over the weekend, the fish the dolphins were feeding on may have moved upriver. Despite rumours that the dolphins were gone, the three bottlenose dolphins recorded at Bunratty Castle made a brief appearance towards high water tonight as they travelled downriver. However they soon disappeared. about 30 minutes later they reappeared, foraged off the bridge for around an hour before heading upriver at around 8:30 pm. Apparently they were seen this morning at between 8 and 10am and reported way up river of Bunratty during the day. 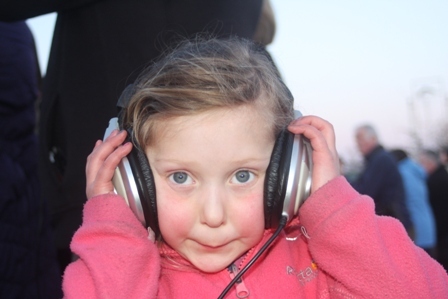 The SDWF were at the bridge from 5 until 9pm with hydrophones informing people about th edolphins and sharing the incredible sounds foraging dolphins make. Anybody interested in seein gthem might try and be a tth ebridge around high water which will be around 9-10am and again 8-9pm in the evening. The dolphins appear healthy, mobile and capable of transitting both upriver and under the bridges. The SDWFwere present at Bunratty all day today to make a detailed assessment of the dolphins condition and long term prognosis. Dr Simon Berrow was present 2 hours before low tide and up to high water at 7pm. This gave an opportunity to observe the dolphins behaviour from low to high water and assess their reaction to the bridge, which has been reported that they were unwilling to swim under. The NPWS were also present from 3pm with a number of staff willing to attempt to persuade the dolphins to leave the area. The local Coastguard at Killaloe were also tasked to assist two hours before high water if required. 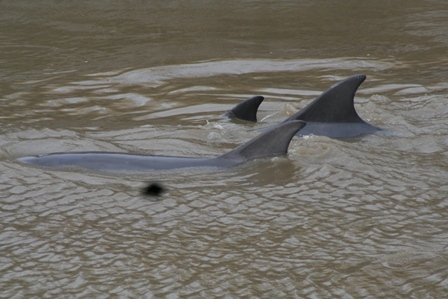 At 11am the dolphins were slowly surfacing in a narrow strip of water around 100-150m up river of the bridge. Surfacing intervals of 20-30 seconds suggested there were not stressed and the group were not tightly bound. As the tide dropped, leaving less than 0.5m water depth at the bridge, the dolphins remained in their narrow channel gently swimming up and down. Close to low water two men in wetsuits and fins entered the water to "swim" with the dolphins. When asked what were they trying to achieve and were they aware that their actions were illegal and stupid and that there was a mother and calf present, they had the appropriate smug and arrogant replies. As they approached the dolphins became agitated, formed a tight group and slipped past the swimmers. The embarrassment of 20-30 students witnessing their stupidity seemed to put them off and the swimmers soon left. The incident was reported to the NPWS but the swimmers had left Bunratty before they arrived. This reflects the greatest threat to the dolphins - not starvation, not kidney failure but the inappropriate actions of people !! As the tide turned and water flooded quickly through the bridge there was a marked change in dolphin behaviour. The dolphins quickly approached the bridge and spread out across the rapidly expanding river. We deployed hydrophones from the bridge and were treated to an amazing orchestra of dolphin echolocation, whistling, grunts, groans and feeding buzzes. Yes, the dolphins were foraging. Over the next 4 hours we witnessed feeding rushes, feeding buzzes and saw fish being caught on at least three occasions. Two were large individuals, possibly mullet and one a smaller, round fish, possibly smelt. As the tide rose the dolphins swam under the bridge, surfacing and even breaching right under the bridge they were "afraid to pass under". So the dolphins still appear healthy, their surfacing behaviour is "nomal", they are actively foraging and showed no fear of the bridge. Local opinion suggested there were up to 10 dolphins at the beginning, but four remained imitially, with three present over the last few days/week. The dolphins include an adult and a calf, maybe 2-3 years old, and one immature. It is our, and the NPWS opinion, that the dolphins are healthy, well able to pass under the bridges if they wish and are actively foraging. NPWS stood down their intention to try and encourage the dolphins to leave. It looks like the dolphins have found a good food source and are exploiting this opportunity on each flood tide. Between tides they are resting in a shallow pool. We will continue to monitor the situation and use images to assess the condition of the dolphins over time. We encourage people to go and admire these fantastic animals from the safety and comfort of the bridge, as it is a fantastic spectacle. We also hope that those people who wish to swim with them, throw stones and other inappropriate behaviour stay away and do not do anything to force our authorities to act to protect people rather than to protect the dolphins. Enjoy it while it lasts !! 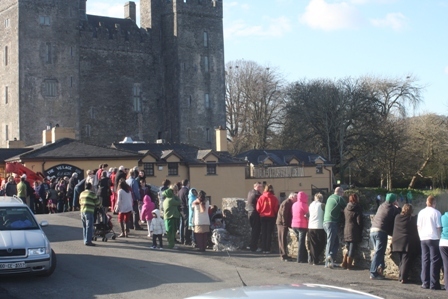 SDWF have confirmed the bottlenose dolphins off Bunratty Castle are from the Shannon population. Isabel Baker, researcher at the Shannon Dolphin and Wildlife Foundation has matched two of the dolphins to the Shannon Dolphin catalogue held by the SDWF using images supplied by Pat Flynn. This confirms the group as Shannon dolphin, which suggests they are used to navigating in shallow tributaries of the Shannon Estuary. SDWF have just confirmed the three dolphins off Bunratty Castle are bottlenose dolphins and should be left to swim back to the Shannon Estuary. 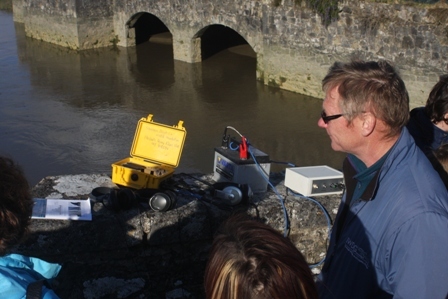 Three dolphins were reported swimming in the muddy creek at Bunratty Castle on Sunday. The dolphins were reported as common dolphins but recent video evidence shows them to be bottlenose dolphins. The Shannon Estuary is a Special Area of Conservation for bottlenose dolphins and thus they and their habitat is fully protected. 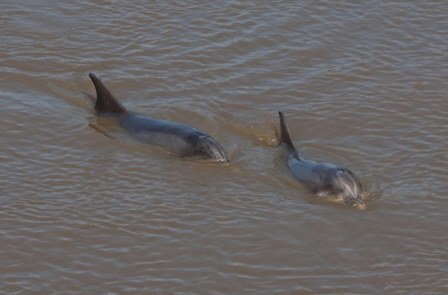 Although it is very unusual to see dolphins this far up a muddy creek, recent acoustic monitoring carried out by the SDWF have recorded bottlenose dolphins on 15% of days off Shannon Airport and 25% of days off Aughinish; thus bottlenose dolphins are upriver much more than we previously thought. The dolphins in the video do not seem to be stressed but local observers suggest they seem reluctant to pass under the bridge at the site. However they must have swam under this bridge to get to their present location. SDWF recommend that the dolphins are left alone to swim back down the creek when they are ready. Obviously if they become stressed (as determined by breathing rate) then more intrusive action may be required. Bottlenose dolphins in the Shannon Estuary are frequently observed foraging in shallow waters around the estuary and are well use to being in very shallow water. It seems extremely unlikely that the dolphins will strand but of course the situation needs to be monitored.